Thousands of high-quality images, graphs, and table elements to make you presentation stand out. Jumsoft’s Infographics app is not so much an app as it is a collection of high quality images, graphs, and table elements you can use and repurpose in Keynote presentations. Or, translated into a little old-school parlance, this is high quality clipart designed for use in Keynote that, unlike normal clipart, can be edited and updated so it looks and works just the way you want. Infographics is purchased and downloaded from the App Store, but the app itself is really just a delivery system for Keynote templates containing Infographics’ custom table, graph, and graphic elements. (It should be noted that everything in Infographics, and more, is available as an in-app purchase in Jumsoft’s Toolbox for Keynote app.) This is an important distinction. You don’t create any Keynote elements using Infographics, instead you open them in Keynote and copy and paste them into your own presentations. You’ll need Keynote 6 or later in order to use any of the templates in the app. Also of note, while these are designed for Keynote, you can use any Infographics element in any iWork application. 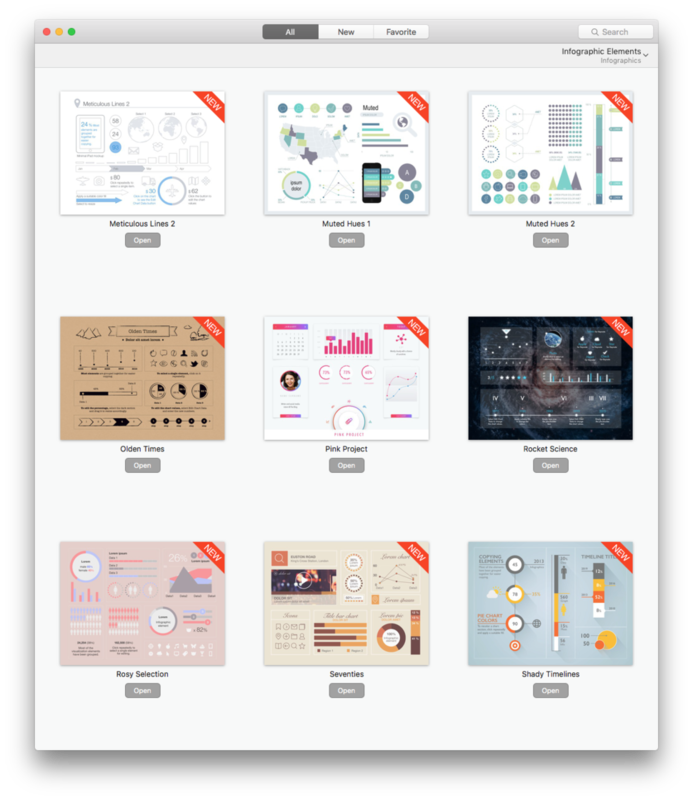 The Infographics app is a Keynote template delivery systems that gives you access to a huge collection of graphic and chart elements you can add to your Keynote presentations. Opening Infographics reveals a collection of over 850 documents containing dozens of graphic elements each. These documents are organized into eight groups: Infographic Elements, Data Visualization, Country Maps, Diagrams, Flags & Symbols, Region Maps, U.S. Symbols, and Chart Themes. A menu at the upper-right of the app lets you quickly jump to any of these groupings, or you can use a Spotlight search feature to find specific elements based on search terms. When you find a document you’d like to use regularly, you can mark it as a favorite and use the Favorites tab to quickly find it again. Double-clicking one of these templates within Infographics opens a preview, while clicking the Open button opens the template in Keynote. Once a template is open you can begin putting it to work. Documentation for how to use each element is found in each Keynote template. 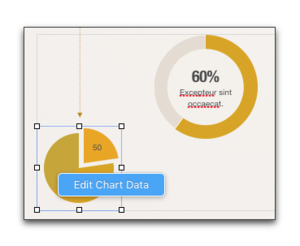 Every item in each Infographics template has been created using Keynote’s graph, table, and drawing tools, which means that adding one to your Keynote presentation doesn’t mean you’re stuck with the way it looks. Infographics’ templates all have detailed information about how to make changes to each element. As a result, the app doesn’t have much in the way of “official” documentation. The templates are the documentation. Chart data can be changed using Keynotes chart editing tools. Once you add an element to your presentation you can use Keynote’s formatting tools to make changes. Want to edit the chart data? Double click a chart until the Edit Chart Data button appears, then make changes to the table data and headings. Likewise, selet any graphic or text element and you can use Keynote’s formatting tools to resize, change color, add opacity, or otherwise change the graphic element. Every graphic element is created using many smaller elements that you can select, edit, and use individually. My only complaint about these graphic elements is minor but necessary to mention. When looking at an element it is not always clear whether or not the element is something that can be manipulated by editing a table or whether you have to edit it using formatting tools. I would occasionally find myself repetitively clicking a bar graph only to discover that it was actually a graphic element that wasn’t tied to any underlying data. I know... cheesy complaint, but worth mentioning if only so you avoid my initial confusion. Infographics is, in a word, phenomenal. Thousands of superior-quality, editable graphic elements that will help you visually convey most anything you need to in a Keynote presentation, all for a mere $20. That’s a small price to pay for great.